In a previous post, we linked to the "Bird Poops in Mouth Video" which has to be one of the most hilarious things around. Emil Steiner, at Off/Beat, now cautions that the video might be [oh horrors!] a hoax! Who cares. It's still funny. Right? In Cincinnati, Ohio, searchers on the ground and in a sheriff's department helicopter Monday were looking for an Angus steer that postponed its date with a slaughterhouse by bolting out a gate that had been inadvertently left open. In Australia, police were forced to shoot a cow which was discovered toddling along a major motorway near the town of Nerang, 43 miles south of Brisbane, after it escaped from a nearby property. In Indonesia, a Boeing 737 was landing at Merauke airport in southwest Papua when it hit a calf which was running across the runway. The plane suffered damage to its left engine but no one was injured. The report did not say if the calf was killed. A Pennsylvania man has been sentenced to two years probation and 50 hours of community service for mailing a bloody cow's head to his wife's lover. In Quasqueton, Iowa, Keith Franck got an unexpected surprise when his cow gave birth to rare triplets. 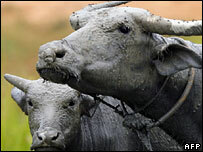 Triplets occur about once in 100,000 births among cows. This is a Namib Desert Golden Mole, Eremitalpa granti namibensis. There are more cute mole photos here. Photo: G. Rathbun. Jennifer Rae Atkins, in her blog, the Daily Mammal, is attempting to draw [close to] every mammal on earth. Therefore: a mammal a day. Since there are about 5,000 named mammal species, give or take, it should take her about 14 years to meet this goal. That's not so bad! The Fennec Fox, at left, is one of my favorites. Why is it that the first we hear of the cat is when it appears in Egypt around 2,000 B.C. as the living embodiment of the goddess Bast? The dog was domesticated...comfortably ensconced as man's adoring servant, catching frisbees and letting his tongue loll unattractively out of his mouth, long before the cat arrived on the scene. Why? Where was the cat? Why are there no images of cats in cave paintings? Why is the Bible silent on the subject? Keep reading - Nichole Hollander will answer all your question. Video: Siamese Cat Talking. Siamese. Video: Bird Infestation, Oh, Yuck! Video: Squirrels in a Popcorn Popper? Saving Georgia Dogs, Inc. is participating in a challenge being offered Six Degrees, partnered with the Case Foundation and Parade for America's Giving Challenge. The four charity badges that have the most unique donors will receive $50,000 for their cause. This could mean hundreds more lives saved in Georgia's kill shelters. They need your help!! The Challenge ends on January 31, 2008 at 3:00 pm eastern. SGD is a non profit 501(c)3 animal welfare organization and licensed rescue. All donations are tax deductible. The winners are determined by the number of donations, not the amount of money donated. They just need $10 donations to help them win! Please donate by clicking the orange donate button HERE. Georgia euthanizes 90,000 adoptable dogs each year, more than New York, New Jersey and Oregon combined. Another horrible fact is that some shelters in Georgia still use the gas chamber as a means of euthanizing these animals; it’s a cruel and inhumane death. The goal of SGD to stop this practice and to implement plans that not only rescues many more animals from shelters, but to help prevent animals from ending up in these shelters in the first place. Their goal is to implement programs for spay/neuter clinics and to lobby for mandatory spay/neuter requirements in local counties, to start a heart worm prevention/treatment fund to help low income families keep their pets healthy, humane education programs for local schools and a program to help victims of domestic violence who are staying in abusive situations because they don’t want to surrender their pets. Anna Kuperberg photographs dogs. She made this blog, SlobberSpace, to entertain you and to help you procrastinate your boring office work. There is no useful information on this blog, no training advice, and no breed analysis. Just happy, goofy dogs. You think your favorite restaurant is too far to drive? What kind of fuzzy worm is this? There are about 10,000,000,000,000,000,000 insects on earth at any given moment. Seriously, that's a real number. For every one of us, there are 1.5 billion bugs. But some of them are so horrifying, just one is too many. Cracked showcases five insects you want to avoid at all costs. These are really creepy! A good lesson for those of us trying to teach our children and grandchildren not to be afraid of dogs and to treat animals with respect, Terrierman points out that it is NOT always OK to pet a strange dog, or to leave small helpless children alone with dogs. "A dog that bites does not violate any laws of nature. And, as uncomfortable as it may make some breed defenders, biting is very much in the nature of all dogs, and some breeds in particular. A Jack Russell is one of them. " Pink Tentacle has discovered a unique chocolate made to look like a beetle larva. They say this confection has captured the fancy of candy aficionados in Japan. Produced by the Komatsuya confectionery and bakery based in Akita prefecture, the bite-sized Larva Chocolates (Youchu Choco) have a grub-shaped body made from milk chocolate and corn flakes, a layer of skin made from white chocolate, legs made from tiny strips of dried squid, and a dainty mouth made from orange peel. 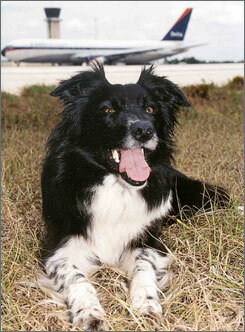 * Since 2001, Southwest Florida International has used a 9-year-old border collie named Radar to patrol the runways and chase away birds. Birds being sucked into aircraft engines is one of the most persistent safety problems at airports. Border collies scare the birds but don't harm them. * Grace Saenz-Lopez, the mayor of Alice, Texas, has been indicted after neighbors accused her of taking their dog, a 5-pound Shih Tzu, while she cared for it during their vacation. The day after her neighbors left with their kids for vacation, Saenz-Lopez called to tell them that their dog Puddles had died. But three months later, the same dog, now renamed Panchito, was spotted at a local dog groomer. When Saenz-Lopez refused to return the dog, the family filed a criminal complaint and a civil lawsuit against her. * Derick Phanord who killed his dog, Maximus, by pouring gasoline on the pit bull and setting it on fire, was sentenced Tuesday to 2 years in prison for animal cruelty. "I am not a monster. I am a good guy," a weeping Phanord, 22, said before his sentencing. "I am an animal lover," he said. * The Fort Worth City Council approved an ordinance Tuesday banning dog tethering. The new ordinance, which becomes effective this week, makes it illegal to use a chain, rope, tether, leash, cable or other device to attach an unattended dog to a stationary object or trolley system. A dog still must be confined within a secure enclosure at all times. This is so cute your teeth will hurt from watching it . . .
At 6ft 6ins and still growing, Digger the Clydesdale has become Britain's biggest horse, according to the Daily Mail. Best estimates put the strapping Clydesdale at 19 hands and two inches (6ft 6in) - on a par with Britain's biggest living horse. And at just four years old, Digger is the equivalent in equine terms to a teenager so there is still time for him to grow. Tina, from Niota, Tennessee is now in the Guinness Book of World Records for 2008 as the Tallest Horse in the World. At 20 hands tall, Tina is nearly seven feet tall. She has taken the top spot from former record holder Radar who is a little more than 19 hands tall. Tina should have no problem holding on to her new title. Her owners expect her to continuing growing, topping out around 23 hands. * A Montana man says he was lucky to find a mechanic without a snake phobia when his pet Burmese python hid under the dashboard of his car. * In Britain, six abandoned kittens have found an unexpected new mother figure - a pet rabbit. Why would someone do this? I can't figure it out. Is this an extreme cat lover? Or just an extremely offensive person? Photo found at Sling's Domain. Is your dog a little stinker? Inspired by Randy Boudouris's ride to benefit Cystic Fibrosis, Bill Craig will set off in April of 2008 to bike from Dallas, Texas to Dallas, Georgia to raise awareness for the need to Spay, Neuter, and Adopt. This ride will also raise funds for various shelters & humane societies along his route. Craig is riding in support of the Spay, Neuter and Adopt message, and he will be stopping at many different animal shelters along his route to talk to people about the importance of spaying, neutering and adopting pets. Visit his website http://www.d2d4wetnoses.com/ where he has a lot more information about his trek. Ann Smith is a graduate of the Rhode Island School of Design in Illustration. She creates robot-like animal sculptures out of broken electronics and machines which are sold in stores and galleries throughout the United States. Couldn't find his Burberry scarf? Want to to feed a tiger? It's just a faux "paw"
Why did the seal cross the road? Is this the next Firedog?